An example of a circulatory 1¶ note, which will be approximately equal to $1.91USD. 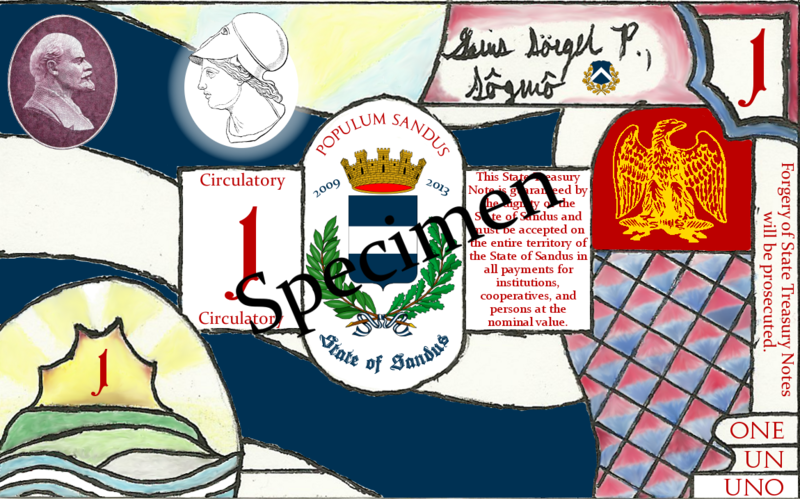 The Bureau of the Treasury, a sub-section of the Office of the Sôgmô has unveiled a series of circulatory and non-circulatory State Treasury Notes for release into the Sandum economy. The release comes as major work has been invested into the Tellus Agrarian Cooperative, as explained in an other Veritum Sandus article. Circulatory Notes will be released for use in the economy, whereas Non-Circulatory Notes shall be made available for purchase by visitors of Sandus and by those interested in the currency. Already considered to be unique by many foreign micronationalists, the new Persumae notes — the third set to be created yet the first to be put to printing by any Sandum government — are rich with symbolism. A stylised version of Anticosti lies between the thrashing sea waves and a sun that shines brightly, even surpassing the flag which shrouds the vision of Anticosti. The Sandum flag and the Sandum coat of arms take up most of the space, as well as the Sovereign Eagle which also represents the Citizens’ Communist Party of Sandus. Revolutionary fore-bearer Vladimir Lenin and Sandum matron Athena gaze at one another, representing the Sandum culture. The Sandum Philosophy is represented well as the Flag represents Buddhism, the CCPS emblem and Lenin represent Socialism, and Athena and the column represent Sancta. As explained in the Decree which established the Bureau of the Treasury in the Office of the Sôgmô, the value shall be linked to the amount of wealth in US Dollars in the Treasury’s Monetary Vault. Furthermore, it shall be illegal to export or otherwise alienate Circulatory Notes from the Sandum Economy, thereby decreasing the value of the Persumae as the Treasury would have to print more Circulatory Notes. At the moment, a sum of 100¶ is expected to be printed on recycled paper, thereby making 1¶ equal to $1.9062USD. Denominations of Persumae shall come in binary amounts: 1¶, 2¶, 4¶, and 8¶; Sandum-ally and Renasian Meritarch Jacob Tierney argued the case so that sums would be easily made by fewer Persuma Notes: an argument that is attractive to the Treasury so as to keep the value of the Persuma high and also for environmental reasons (so that less paper is used in printing). Tierney argued for a 16¶ note, though this concept was rejected as it was considered to be too high an amount. An example of a Non-Circulatory 1¶ Note, which shall be made available as a gift from the Office of the Sôgmô and for purchase in the future. Non-Circulatory Persumae Notes will be available to be gifted by the Office of the Sôgmô and shall be made available for purchase in the future. Unlike the Circulatory Notes, however, the Bureau of the Treasury is uncertain what to peg the value of the Non-Circulatory Notes to. At the time of writing, no attractive concepts have arisen. Special security features shall be included with each Note, including a serial code, circulating official identification, and a unique feature of using a mixture of oil and tea, in lieu of ‘shadow’ security features. Information on the security features shall be placed onto the Treasury’s newly established database, which authorised officials may access to see if a bill is valid or is counterfeit. As soon as the Office of the Sôgmô receives 100% recycled paper, work shall begin on the last of the phases: printing of the Persumae Notes. Congratulations; it is lovely to see that you have used the method of incorporating hand-drawn and computer-edited images, like we have in the Landashir’n Community.